Best known for his role as "Coronation Street's" loud-mouthed but likable rogue, Les Batterbsy, Bruce Jones' new biography will be as explosive as any of his on-screen alter ego's punch-ups. 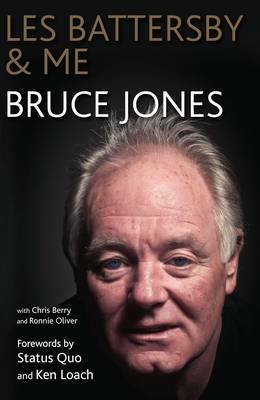 From an ordinary working class boy-hood in Manchester and Wales, to starring in the nation's best loved soap opera, and then a dramatic fall from grace splashed across the tabloid press, Bruce Jones' life has had more dramatic twists and turns than any film script. He tells of growing up in a working-class home in Collyhurst and later with his Grandmother in Wales and how joining a local drama group set him on the path towards a life on stage and screen. He recalls the hard slog of his early years in showbusiness, as part of the comedy duo 'Clarke and Jones', and then his big break when he was offered the lead in Ken Loach's film "Raining Stones", which led to award winning roles in some of the best British films of recent decades, including "The Full Monty", Shane Meadows' "Twenty Four Seven" and his most recent role in the recently released film sensation "Soulboy". Through the chapters of his book, Bruce also takes the reader backstage on some of our favourite TV shows such as "Heartbeat", "A Touch of Frost", "Band of gold", "Celebrity Star in their Eyes" (appearing as Dean Martin), and "Celebrity Wife Swap" (Sinitta drove him crazy!). Of course, all Corrie fans will want to know about life on the street and Bruce is open and revealing in his insights into his fellow "Coronation Street" stars and how living his life in the full glare of publicity affected his health and family life. His fall from grace - dismissal from "Coronation Street", battles with alcoholism, drink-driving prosecutions, bankruptcy and family upsets - have all been luridly splashed across the tabloid press. And Bruce doesn't shirk from revealing the truth and private misery behind these headlines. For, as well as the glitter and stardom, Bruce has had his share of dark times. None more chilling than his discovery in 1977 of the mutilated body of 'The Yorkshire Ripper's' last victim. For the first time, he reveals the full details of how he stumbled across Jean Jordan's body and came face-to-face with the killer Peter Sutcliffe. An episode that has scarred him for life. But this is not a misery tale. Like his much-loved character, Les Battersby, Bruce is well-used to picking himself up, dusting himself off and starting over. His upbeat approach to life is heart-warming and, as you would expect from such an outspoken and irreverant personality, his book is filled with outrageous stories and laugh-outloud moments.